Caption slip reads: "Photographer: Richardson. Date: 1951-10-10. Reporter: Swaim. Assignment: Cinderella, Pasadena. 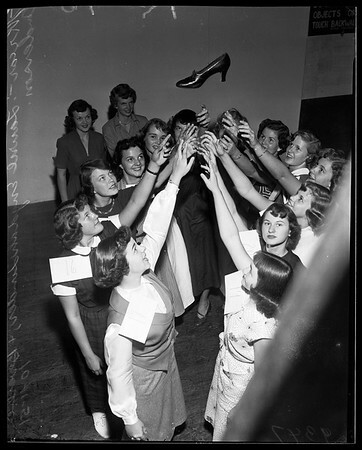 K9, 10: Laurie Engdahl Linder (left, rear), 1951 Rose Princess, and Beverlie (cq) Anderson, 1949 princess, checking a group of John Muir College freshman girls who are candidates in 'Cinderella' contest. Girls are reaching for magic slipper".